A recruiter’s communication approach can make or break a candidate’s success throughout the job search. You need to be attentive and prompt, but that’s not always easy when both you and your candidates have busy days. 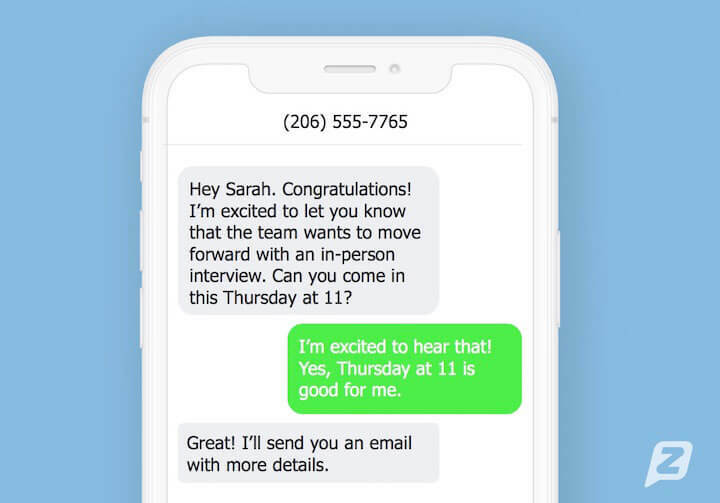 Adding text message capabilities to your recruiting practice can streamline your day-to-day interaction with candidates and help you fill positions faster. With 95% of adults sending text messages every day, texting is easily the most widely used smartphone feature. Your candidate’s preferred communication platform is clear, so why not use it to connect with them? Some recruiting firms have already jumped at the chance to modernize how they talk to job seekers. Here are four reasons why you should join them and incorporate texting into your daily workflow. Between personal messages, newsletter subscriptions and shopping receipts, our inboxes are flooded with emails every day. Competition for our attention is never-ending, so when you send an initial email to your candidates, it runs the risk of being overlooked or marked as spam. Data shows that texts are far more likely to be opened than an email, so break through all the noise and get on their radar faster with a text. You can quickly confirm their interest in the position or go ahead and schedule a phone screening right away. If your candidate is already employed, they may not want to answer the phone or check personal email at their workplace. With Zipwhip’s business texting features, you can maintain speedy conversation throughout the day privately. Text candidates about new job opportunities, remind them of upcoming scheduled interviews and keep them updated during the application process. When phone calls or emails aren’t possible, texting is a faster way for candidates to send you a response while they’re juggling other items on their to-do list. No one likes playing phone tag. It’s a waste of time and can easily frustrate callers on both ends. 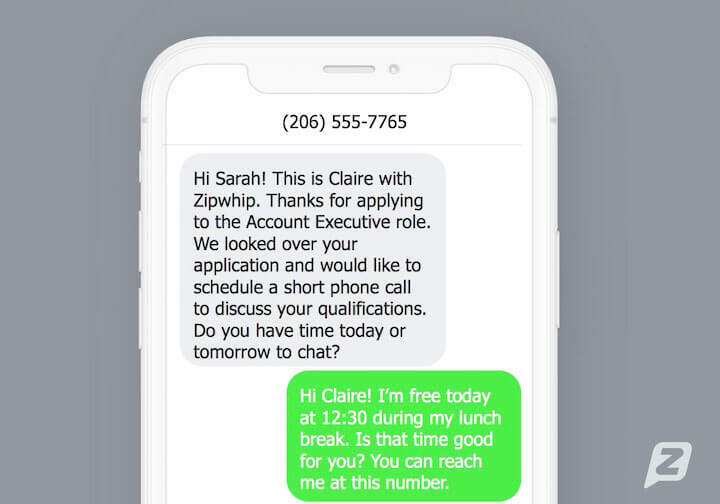 Zipwhip eliminates missed connections and the “Sorry I missed your call!” voicemails, replacing them with easy-to-reply texting options. And voicemail itself is losing popularity, especially among millennials. They’re less likely to leave a voicemail, let alone listen to one. Millennials are the largest generation in the U.S. labor force right now, so recruiters need to consider connecting with candidates via their preferred platform. Doing so increases the likelihood of a fast reply, which gives you the freedom to move them along the application process quicker. Forming relationships with candidates allows you to better understand their needs throughout the hiring process. The more you know about them, the better equipped you are to place them in the right role. Maintain your relationship with regular check-ins using text messaging—it’s less invasive than a phone call and friendlier than an email. Zipwhip humanizes your communications by leveraging the power of texting’s conversational language. Your candidates will appreciate the easy-going nature of texting and quickly become comfortable with your interactions. They’ll be more likely to send a quick reply with updates such as any new skills they’ve learned or changes to their job requirements. Candidates favor texting over phone calls or emails, and they’ve adopted it as a preferred method of communication. Reach them this way with Zipwhip’s two-way business texting software. Send and receive text messages from an existing landline, VoIP or toll-free phone number with the convenience of managing it all from your desktop or mobile devices. See how you can improve workflow and candidate relationships with a free 14-day Zipwhip trial.